NASA's planet-hunting Kepler Telescope has spotted the first roughly Earth-sized world orbiting in the "Goldilocks zone" of another star – offering perhaps the best bet so far for life elsewhere in the universe. A year on Kepler 452b, which is about 1,400 light years from us in the constellation Cygnus, is 385 days, meaning its orbit is just a bit farther away from its star than the Earth is from the sun. That places it squarely within what planetary scientists call the habitable zone, or "Goldilocks" zone — not too cold and not too hot. "In my mind, this is the closest planet indeed to Earth," Jon Jenkins, Kepler data analysis lead at NASA's Ames Research Center in Moffett Field, Calif, said at a media briefing. "The star is a little bit older and a little bit bigger and brighter, so it's good that it's a bit farther from its star." And that star is what astronomers label a class-G, "main sequence" star, the same as our sun. It is of average size and luminosity. While astronomers have not ruled out life around either smaller, dimmer or larger and brighter stars, Jenkins notes that we know for sure that life can exist around a G-class star. 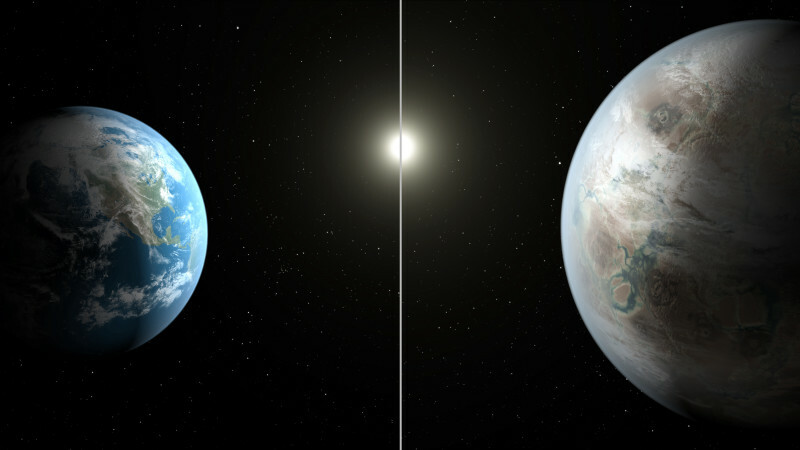 Although Kepler 452b is also a 60 percent larger — and possibly five times as massive as Earth, with gravity about twice as great, there's a "better than even chance" that it is rocky, like Earth, Jenkins says. "It is the closest thing we have to a place that someone else might call home," he said. Kepler 452b is also in roughly the same period of planetary evolution as Earth. It's thought to be about 6 billion years old, compared to Earth's 4.5 billion years. But the estimate for Kepler 452b is based on models of stellar evolution, which could be off by as much as 2 billion years, which means on the lower end, it could be a contemporary of Earth, while on the upper end of the margin of error, it could be nearly twice as old, Jenkins says. "It's awe-inspiring to consider that this planet has spent 6 billion years in the habitable zone of its star; longer than Earth," he said in a statement from NASA. "That's substantial opportunity for life to arise, should all the necessary ingredients and conditions for life exist on this planet." The Kepler Telescope looks at a periodic, subtle dimming of distant stars that represents a slight blocking of sunlight as an orbiting planet passes between us and its parent star. But because the plane of the orbit must be parallel to Earth's line-of-sight to be detected, Jenkins says that each discovery of an Earth-like planet by Kepler leaves possibly another 50 undetected. Today, a total of 1,030 "extra-solar" planets have been identified, most — known as "hot Jupiters" — that are much larger and orbiting their stars much more closely than Earth. "Exoplanets, especially small Earth-size worlds, belonged within the realm of science fiction just 21 years ago," the NASA statement says. "Today, and thousands of discoveries later, astronomers are on the cusp of finding something people have dreamed about for thousands of years — another Earth."